Double row chromatic harp by Pere Elias, with strings traditionally cross strung. The sound is realy excelsic and reminds a bit of lute. A very light weighing Instrument (6-7 kg). The harp may be either fashioned following each and every detail of the rendering by Hieronimus Bosch or be sculpted in a simpler way to be less costly. Height: small 36,5", large 43"
This Harp technically is a compromise between historical and economical way of construction. 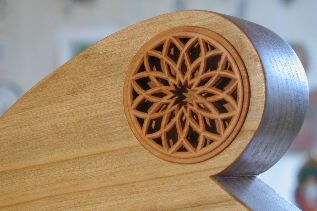 The soundboard is fashioned the historical way out one piece of tonewood, carved and arched to serve for an authentic sound. The side- and end pieces are taken from the same log of wood and glued together in a way that the fibre of the wood is matching. Thats why the way of construction is only visible at a closer glance, and the sound is not hampered in any way. The idea for this harp came in a peculiar way: After making a Dopia (a double harp with two rows of strings chromaticaly tuned), I was very impressed, that the corpus build in semihistorical way with vertical strained soundboard was coping with the tension of so many strings. The wish of the harper Oliver from Hamburg to own a light harp and my enthusiasm let me develope a plan i.e. 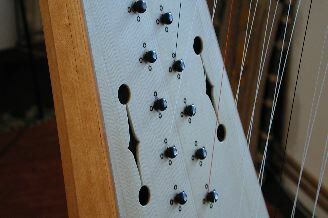 a backbreeding (similar to the gallowy buff backbreeding), in which the tension of the Dopia equipped with 45 strings is distributed over only 28 diatonic strings of a simple harp. The result was this already two times built relativly large renaissance harp in gothic stile - and now it comes -, whichs pitch copes with "modern" irish harps, but retains its typical gothic sound. Double row chromatic harp after an italian renaissance harp. In the middle string range the harp is strung tripel, in the photo over 1,5 octaves, but historically smaller (0,5 octaves).